How many of us have a neatly typed strategic plan in a three-ring binder sitting on a shelf gathering dust? No? Liars! I’ve asked this question at a number of the conferences I’ve spoken at recently and more than half the people sheepishly raise their hands. In talking with folks afterwards, it seems that most managers go from the discovery phase where you’re pulling together market research and competitive intelligence, directly to talking about the plan. We tend to skip the phase between discovery and strategic planning which is the thinking phase. Hence, the organizational lobotomy. The strategic thinking phase consists of getting the right people in the room and no, it’s not just the C-level. We should be including the high-potential managers from across the organization and in different functional areas to give us a greater range of insights. Then it’s a matter of prepping the team with a Strategy Survey to focus their thinking on the key areas of the business (market, customers, competition and company). When the group comes together for the two-day off-site meeting, it’s not about the budget first. It’s about challenging our fundamental assumptions on the business and taking a hard look at what we’re offering, who we’re offering it to and how we’re doing it in a unique way. 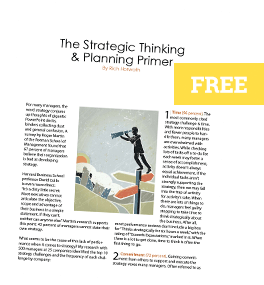 During the off-site, about 4-8 different strategic thinking frameworks can be used to collect the group’s key thinking and generate the insights that will drive this year’s plan. Skipping the strategic thinking phase on a regular basis puts your group in the category of functional zombies–mindlessly doing the same things year after year with no coherent direction in site. Give people the time and tools to productively think about the business and you’ll be amazed at where they can take you.